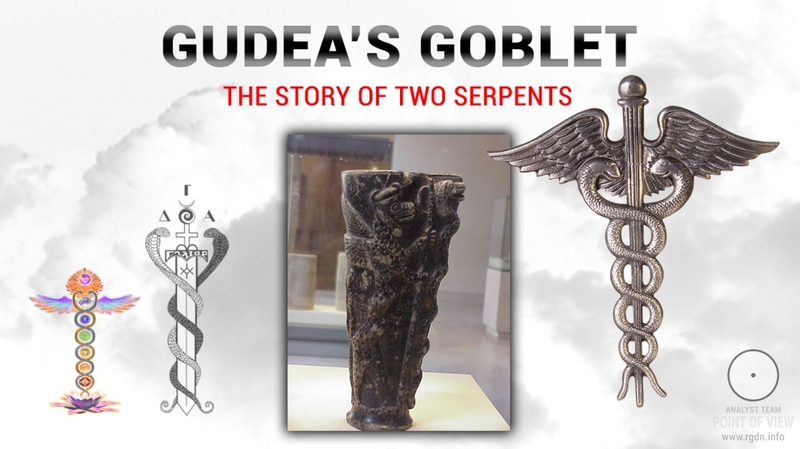 Ancient people drew the ABC of their initial abstract concepts from spirals that embodied major laws of nature and correlation of those, as well as logical thinking, philosophy, culture, and world outlook of the ancients. ... In 1698, the Swiss mathematician Jacob Bernoulli performed… a surgery on a spiral: he cut a spiral in two through its centre, straightened the two spiral segments and obtained a certain harmonic scale, which was mathematically analysable! Thus, the famous law of the golden section, or the law of the golden ratio as mathematicians call it, came into being. It would be fair to mention that pictography (the early written language) emerged from ornamental motifs. Ornamentation was a way to communicate sacral knowledge. Ornament researchers believe it appeared in the Upper Paleolithic (15,000-10,000 BC). 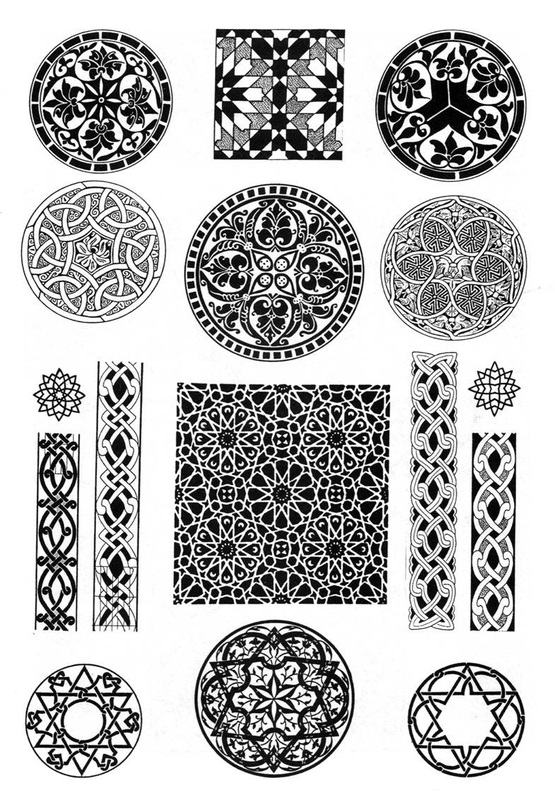 Ornaments were based on non-visual symbols, were almost solely geometric, and consisted of strict shapes such as a circle, a semicircle, an oval, a spiral, a square, a rhombus, a triangle, a cross, or various combinations of those. Decorations also included zigzags, strokes, stripes, herringbone and wattled (“rope”) patterns. 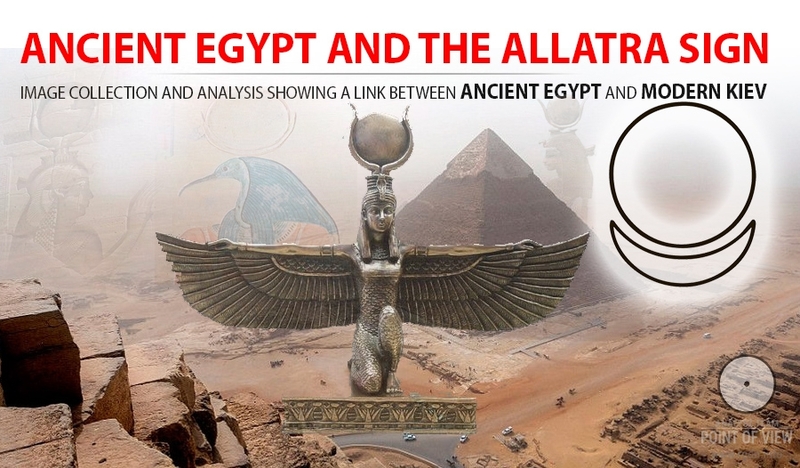 Ancient people represented their ideas of the structure of the universe via certain signs and often covered hidden parts of items – bottoms, reverses of adornments, amulets, talismans, etc. – with ornaments. 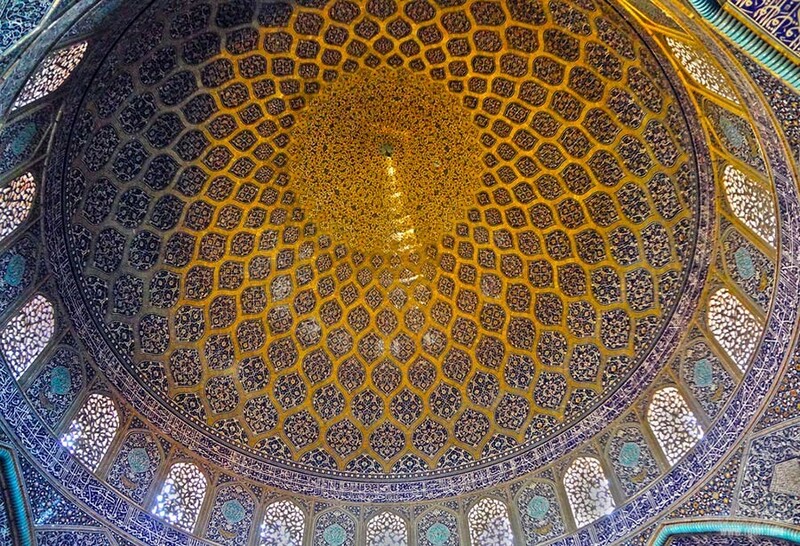 It is a complex geometric pattern in Muslim art of the Middle East. Ornaments as works of art, as symbols have existed for over millennium. 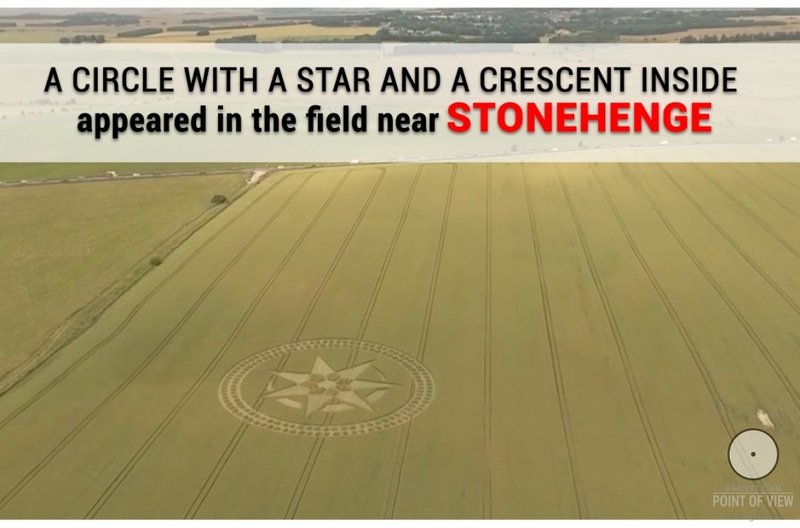 Furthermore, it may be asserted that ornaments emerged at the very dawn of human history, so they may be considered one of the oldest ways to express sacral knowledge. Ornaments are meaningful and deep in their essence, since they are based on signs and symbols. 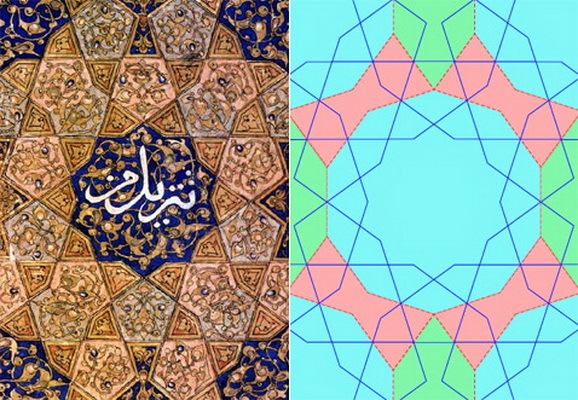 geometric Girih (right-angled and polygonal continuous netted shapes and knots). Girih is an intricate pattern formed of repeated superposition of geometric shapes – lines, polygons and circles – on one another. Girih looks like a super-complex mathematically adjusted net. 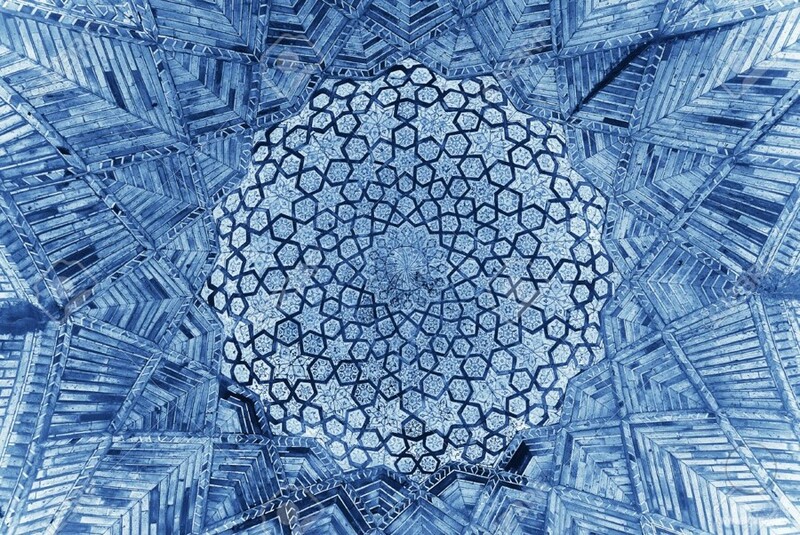 In Islam, girih shapes depict the structure of the universe. 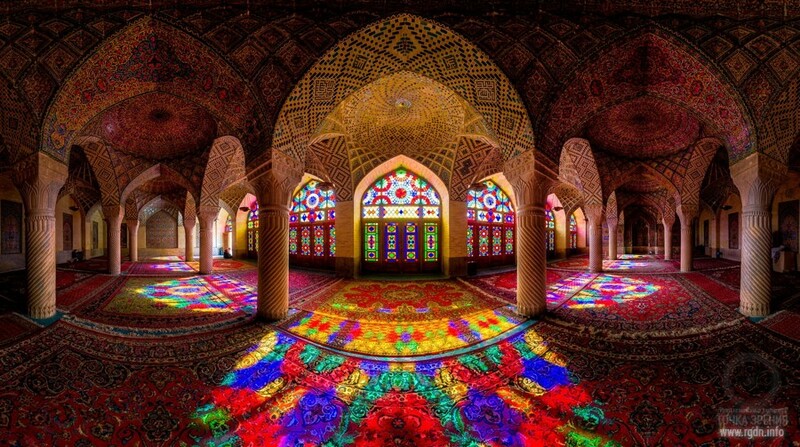 Girih patterns usually decorated facades of buildings and mihrabs inside mosques (mihrab is a niche where imam stands before the prayer). Geometric shapes superposed on one another in a girih composition have a mystic meaning. Sometimes such shapes coincide with symbols of other cultural traditions. For example, a hexagram – two triangles put on each other – is one of the most ancient and widespread religious symbols found in Islamic girih patterns. Such image is found on rock paintings and Neolithic artefacts. Arab ornaments and calligraphy have been developing as if concurrently. When new patterns were invented, they were applied in both ornaments and calligraphy. One of Arab ornament peculiarities is “carpet” ornamentation, where a pattern covers the entire surface of an item or structure. In nearly all Islamic decorations brief inscriptions are present: proverbs, favourable adages, aphorisms, etc. Flora images most often include flowers, shoots of climbing plants, and so on, depicted in a natural or stylized way. Roses and pomegranates have always been very popular, because they symbolize heavenly life. Drips (stalactites) were used in Islamic patterns, too. 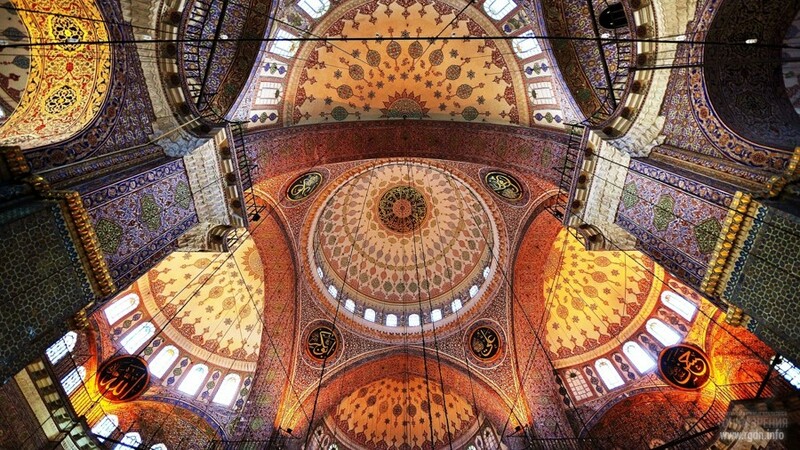 The two types of Islamic patterns embody the deep inner quintessence of Islam. 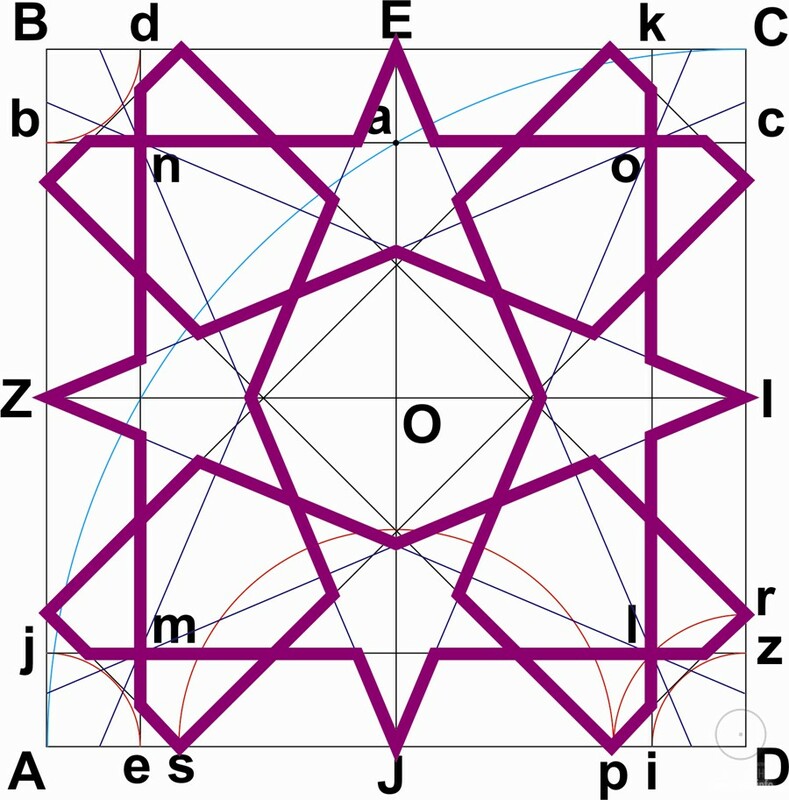 Girih that expresses absolute perfection of geometric beauty is a symbol of the divine principle, whereas Islimi, which depicts living, fragile flowers, symbolizes the human principle. Islimi and girih patterns are always strictly mathematically adjusted and estimated. Versions and compositions of the patterns are diverse, inexhaustible and almost infinite. It is important to note that such division into the divine and human principles is neither rigorous, nor mechanistic or impenetrable, but is rather maintained according to what is called the hologram principle. It is known that the particularity of a hologram is that, if we break the glass on which the hologram is drawn, in every generated fragment we will see not a part of the original image, but the whole image, though slightly degraded. In other words, when we divide one or another element of Islamic culture into the divine and the human, we will again see manifestation of the original binarity in each of the two “halves”. By the way, some Muslim theologians attribute the etymology of the main name of God Allah to the verb valaha, which means “to be astonished”, “to lose one’s head”. Moreover, girih patterns express another important message, one way or another associated with the idea of God: the motif of eternity as unity in diversity or, it would be more precise to say, unity in many faces. If we look at girih patterns attentively, it is easy to notice such patterns often represent nothing but a configuration made of a single geometric composition repeating itself many times. At that, such composition could multiply endlessly, if it were not for the limitedness of material shapes on which a pattern is drawn. In other words, girih is not an image closed within a limited space, but rather something that always exceeds the limits of physical media available to us. 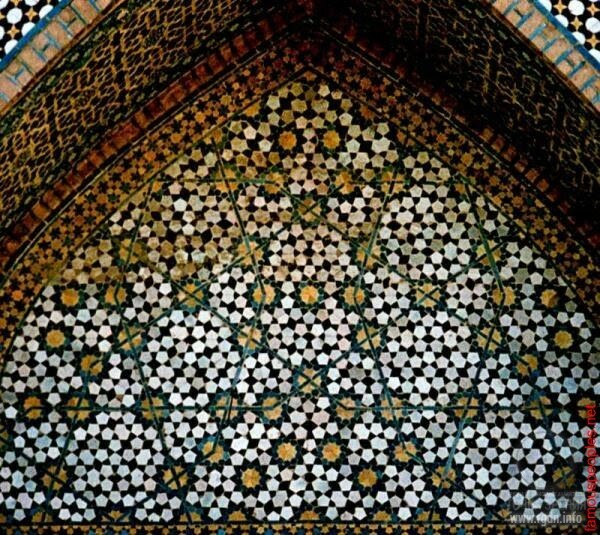 As a matter of fact, a frame that outlines a girih pattern does not determine the pattern limits – it is as if a window which cuts into our world and opens a perspective of eternity before us, such eternity being manifested through fundamental unity of its numerous faces. First and foremost, in its mathematical precision and geometric irreproachability girih represents an image of absolute perfection, which in Islamic culture has always been associated with God. Girih geometric patterns are so accurate and detailed that no words can express the delight of contemplating them. Their astounding complexity and impeccable adjustment fire one’s imagination without any exaggeration. Girih highlights the grandeur and might, the unattainability of heights, the detachment from earthly existence, while Islimi accentuates accessibility, proximity, gentleness and intertwinements of the world around in a warm image. The brightest ornaments are those present in architecture, on books, garments and tableware. For better understanding of the meaning of patterns in mosques it is worth mentioning that in all times mosques have been simultaneously places of gatherings and madrasahs (schools). 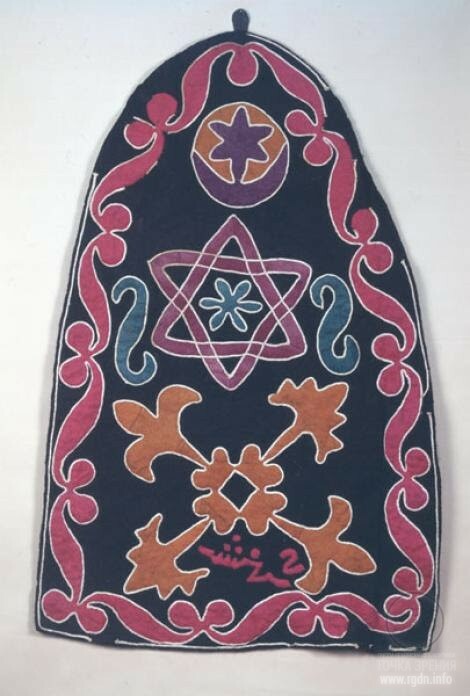 While on the outside girih patterns and the corresponding kufic script were more widely used, in internal decorations islimi patterns and the naskh script were applied. Internal ornamentation was supposed not just to bring a person closer to the spiritual world, but to unite people with each other. In Islamic interiors goodness and steadfastness are dialectically combined. When we look at girih patterns, it always seems that we see squares, rhombuses, pentagons, hexagons, little stars, etc., i.e. all sorts of geometric shapes. 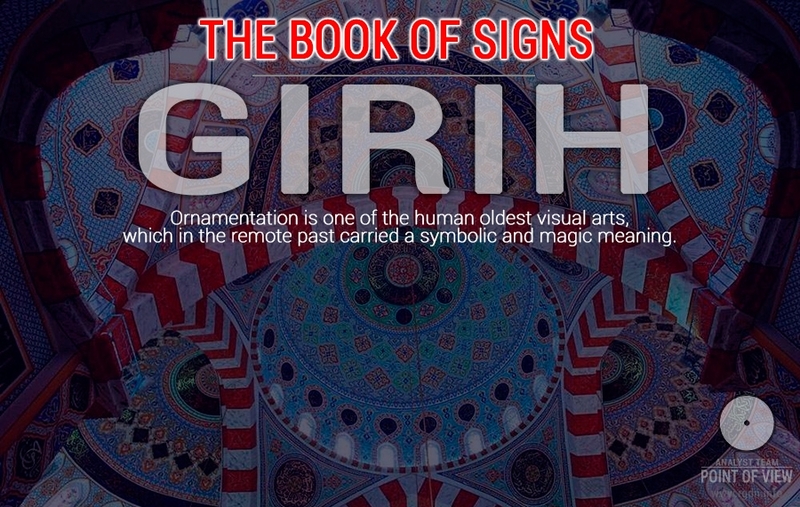 Girih is a book written in the language of signs combined with each other and explaining the plan of creation. The aforesaid motif of eternity manifested through the unity of its numerous faces may also be regarded as expression of transcendence, which is incessantly turning into its immanence. 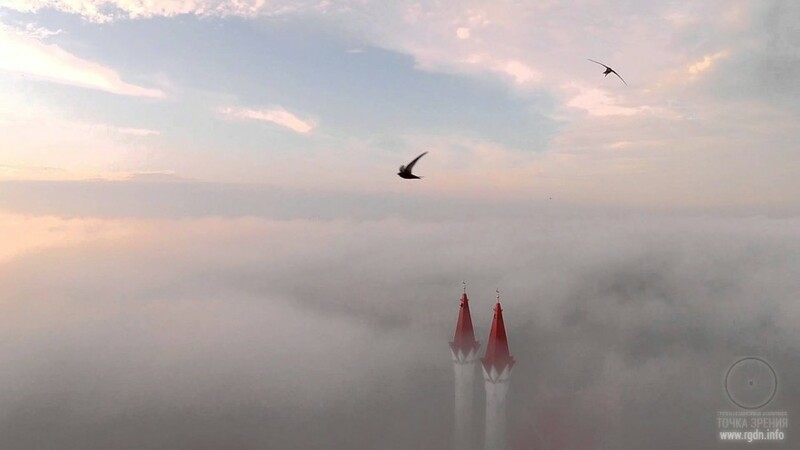 Immanence (Latin immanens, genitive case immanentis – “abiding inside”) is a philosophical category meaning inalienability, inner connection as opposed to external connection. For religious philosophy the concept of immanence (belonging) of the divine to the world is very important. Contemplation of all these tints of the playing diversity of colours within a single basic meaning, captured in its integral totality rather than in a mentally anatomized form, gives one an inexpressible intellectual delight and helps to get a touch of something greater – the spiritual depths of faith. Patterns are most often drawn over the mihrab (a part of the wall with a niche directed towards Mecca, where imam stands for the prayer), and any Muslim can see it only when he gets to pray, whereas neither during the prayer itself, nor during conversations or lessons he does not see it. At that, all other ornamentation includes vegetable interlacement with thousands of flowers and buds on each endless sprout, and it’s not a mosaic where it is easy to make a copy of any previous element, but a picture where each subsequent flower is different from the previous one, though resembling it. The ornament on the upper part of the pillars in the patio of the Prophet’s Mosque in Medina is very special. On the bold shades of girih patterns a stylized contour of palms put together in entreaty stands out. The effect intensifies owing to the contrast of light and dark colours. A feeling arises that not just people, but the building itself appeals to the Almighty. 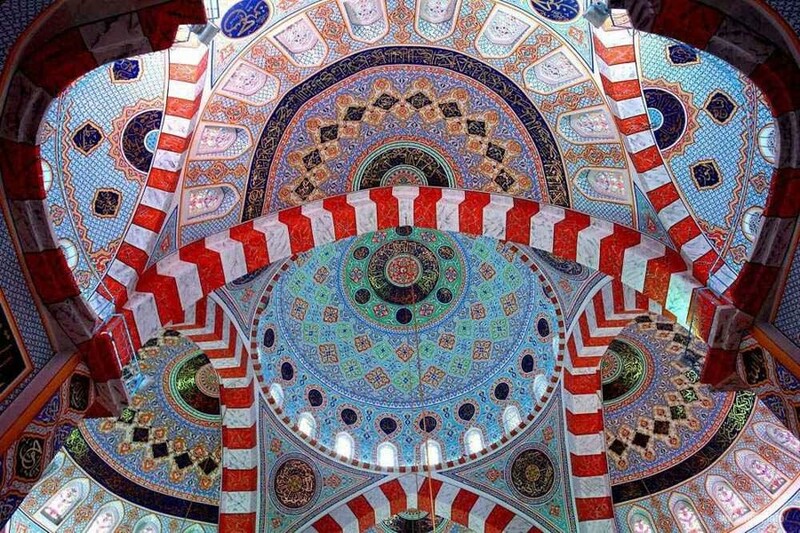 The symbolism and mysteriousness of Islamic patterns is most brightly reflected in decoration of Islamic books. Moreover, ornamentation in the books must be combined with the script, which sort of dictated the trend of ornamentation development, and book ornaments have been the most symbolical in fact. 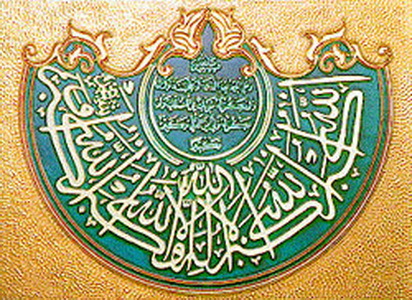 The Arabic inscription Allah includes four vertical lines, schematically communicating the meaning of this word. 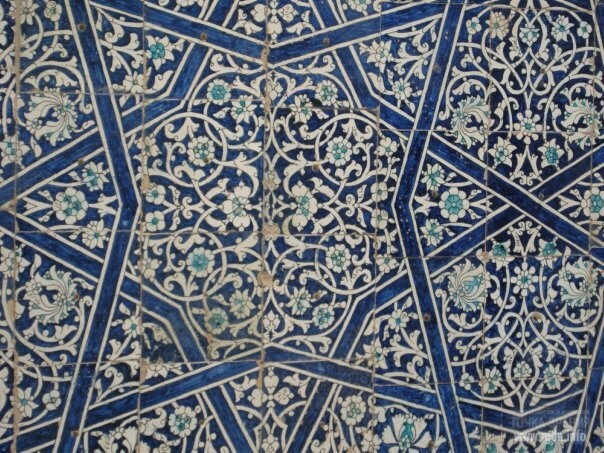 Other widespread ornamental motifs are a pentagon (or five-pointed star) symbolizing the Five Pillars of Islam, and a hexagon (or six-pointed star) symbolizing the Six Pillars of Faith. The holy book of Islam is the Quran, which has always been decorated the most, especially with diverse ornaments. It should be mentioned the Quran case and its first two pages have been ornamented most brightly. Carpets and Islam are inseparable notions, which is due to particularities of Muslim culture and prayers. All carpets, coverlets and prayer mats are usually decorated with rich ornamental patterns. Carpet ornaments represent not just a simple harmony between the world of feelings and the world of things, but also a sort of guideline for the future. A carpet is a symbol, an inanimate portent of the Paradise which every soul, even the most lost one, always hopes for. Woven carpets have turned into a separate art. For centuries they’ve been called “the beauty woven of mysteries”. 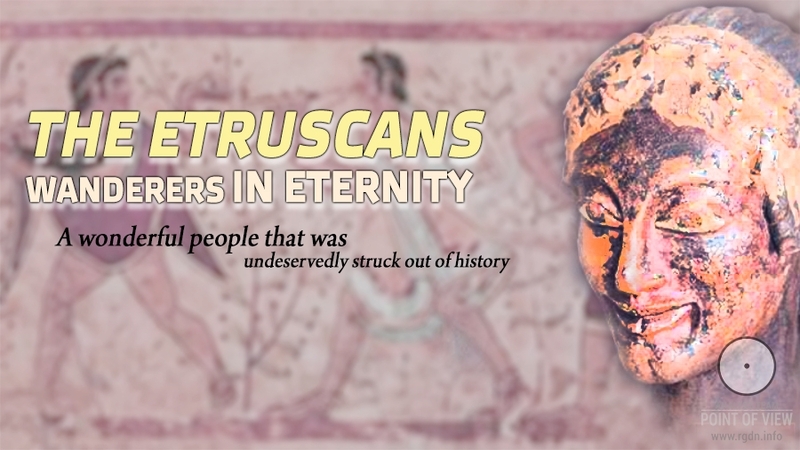 This is totally explainable because carpet weaving was the most ancient handicraft of many peoples. Combining plenty of unusual elements, carpet ornaments preserve verities that open a window to the secrets of our civilization. The secret meaning of ornaments on oriental carpets may well be regarded as a message coming to humanity from remote ages. The ornaments reflect the cosmic laws, the influence of elements, as well as the elements connection with a human being. It is so delightful how informatively our ancestors managed to express in ornaments the concept of the enlightened soul with advanced Awareness. Islamic patterns are distinguished for being arranged around a point which plays the role of a centre of the entire ornamental composition. Sometimes such point is graphically drawn, sometimes an empty space yawns instead of it. However, the most important thing is that such centre remains beyond the entire composition. In other words, the Islamic ornamental pattern does not touch its centre and correspondingly does not flow from it directly. At that, the centre organizes, “supports” the whole composition, being beyond its components. Via such art techniques Islamic culture expresses the main idea described above – the idea of God’s diversity. If a pattern directly flew from its “pivot” / emptiness, we could speak of the ontological correspondence between the centre and the composition, between God and the world. However, the existence beyond is neither a subtle existence, nor any subtle spiritual summit, nor an extension of the material world, but something totally different, non-adjacent to the material. For this very reason in Islamic patterns the symbol of God is either a point having no meaning, or emptiness. Islamic theology teaches that everything in this world was created of nothing. In other words, nothing was the construction material of which the pattern of the existing universe was woven. This means existence of the world as of something implanted in itself is called to question, for the world is actually a continuation of nothing, i.e. a consequence of emptiness, of non-existence. Hence, from the perspective of its own ontological criteria the world is an illusion. “The world is a dream,” as all followers of the Islamic tradition unanimously say. Not only spiritual teachers speak of the perishable and phantom nature of the material world. Contemporary physicists ascertain that matter is revealed as a result of the wave function collapse, the process of decoherence. They state that in a closed system elementary particles are in superposition, i.e. as a potentiality, and “materialize” only as a result of observation, a contact with something external. At that, since, strictly speaking, there are no closed systems in the world, for any system is in contact with something, the only truly closed system is our universe as a whole. Therefore, according to researchers, from the outside “it looks” absolutely empty, unrealized, and if a hypothetical observer passed through it he would pass through the void and stumble on nothing, despite self-crystallization of matter inside it. Naturally, this is a very rough view of physical theories, moreover framed with world outlook interpretations. But an important point is that further more researchers and philosophers notice the resemblance between ancient spiritual teachings and the worldview resulting from modern quantum physics. The phantom, void character of the existing reality is a key category for drawing such parallels. Studying arts and music and the effects thereof, neurolinguists have discovered that arts and music pass consciousness and act on a deeper level of perception. Consciousness has almost nothing to do with processing of such information. Thus, girih is an ideal way to transfer spiritual knowledge to future generations, i.e. to us. At that, in order to read this Book of Life one needs to know the ABC of the Spiritual World Signs. More information about signs and dimensions of the universe may be found in the AllatRa book. 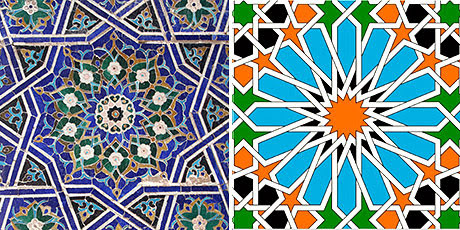 Girih is not just an element of Islamic decorations, but a manifestation of dimensions. The motifs of eternity and unity in diversity can give us inner integrity and harmony with the outside world, which people often lose nowadays, Moreover, the experience of combining what seems impossible to combine certainly makes our thinking broader, more flexible and eliminating extreme judgements that don’t tolerate unusual interpretations. Generally speaking, a view of the world from the spiritual height that girih semantics concentrates in itself may totally neutralize the charge of conflicts and animosity, generated by one or another form of morbid thinking. Isn’t this what the world as a whole needs?